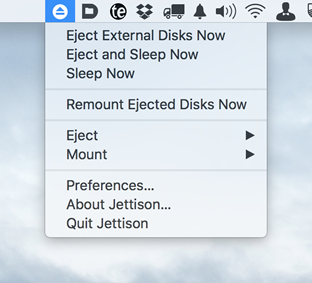 Version 1.4.1 of Jettison is here, providing support for Yosemite’s “dark mode” and improving the logic it uses for ejecting and remounting drives. SD cards and flash drives should eject and remount more reliably. This update looks minor on the surface, but contains a host of internal improvements. Grab your copy now from the Jettison release page. App Store Note: If you purchased Jettison from the Mac App Store, you can still upgrade to version 1.4.1. Just download the new version from our website and double-click on it once before you copy it to your Applications folder. When you do this, it will copy your App Store license so you’re not asked to pay for it again.